A depressed businessman suffering from hypertension finds his car hijacked by three armed bank robbers. A fourth criminal has driven away in their own getaway car with their loot, and a chase begins. What ensues is a bizarre and purposefully absurd odyssey through the streets of Tokyo over a 24-hour period. 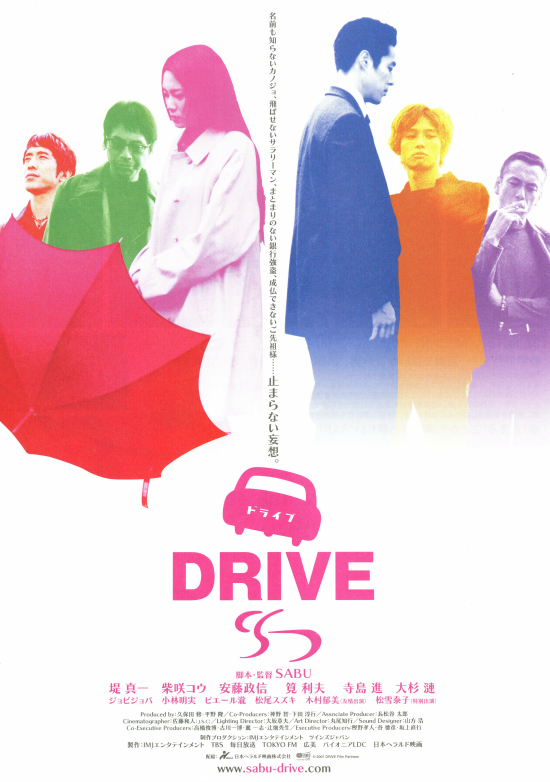 The film is Drive, released in Japan in 2002 and directed by Hiroyuki Tanaka under his pseudonymous alter-ego Sabu. My first encounter with Sabu’s work was his charming 2011 manga adaptation Bunny Drop. Drive is a remarkably different film: where Bunny Drop was a heart-warming conventional comedy-drama, Drive is a slightly darker and considerably more sparsely populated affair. It doesn’t even really have a story as such; just a road movie-style chain of interconnected events. Parts of it work, parts of it do not, and overall it is a little too long for comfort, but in the end there is more good in the film than bad and enough interesting scenes and moments to make it worth viewing. Shinichi Tsutsumi stars as Kenichi, the aforementioned businessman in the middle of a very bad day. He plays the part with a hilarious level of dry understatement. He doesn’t have much dialogue, or indeed many facial expressions. What he does have is a wonderfully expressive pair of eyes that reflect his panic, doubt, confusion and – ultimately – resolve as the film progresses. His strange attempts at passive resistance provide much of the film’s humour: first he refuses to break any traffic laws during his enforced getaway, then when one of the robbers stabs him with a knife he stops the car entirely and refuses to continue until he’s cleaned and dressed his wound with a portable first-aid kit. The three thieves are nicely distinctive, particularly Susumu Terajima’s spiritually obsessed gang leader. He’s not the sort of character that you expect to find leading an armed robbery, and that contrast provides Sabu (who also wrote the screenplay) with a lot of great material with which to work. One strange subplot sees a fourth robber, who ran away on his own with all of the cash, lying in the middle of a field with his arm stuck in a hole. It’s by far the strangest element of the film, and only gets more surreal as the film goes on. When his path and Kenichi’s cross during the climax, the film has reached so far out into the surreality that it’s only partially successful. Thankfully elements are pulled back to reality for the film’s pleasing denouement. There is a lot of benefit in watching these kinds of strange, trippy, late night cult films with a forgiving mood. Despite often being imperfect in execution, they regularly provide the sorts of unusual and inventive material that audiences rarely see in more neatly assembled productions. Drive featured a lot of great comedy, but can also test the viewer’s patience. Ultimately this curate’s egg presents more good material than bad, and will prove a distinctive delight for a particular sub-set of cult movie fan. Personally I’m not quite there, but thanks to the best elements I feel I’m close. Your experience may be right on the money. An earlier version of this review was first published at The Angriest on 7 February 2015.